The FPGA35S6046 and FPGA35S6101 are PC/104 FPGA modules with a PCIe/104 stackable bus structure. 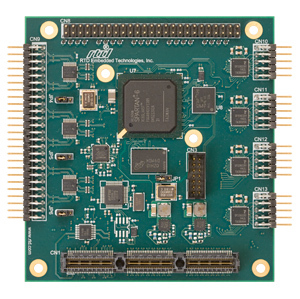 The FPGA35S6xxx modules provide a platform for customer developed FPGA code. They are based on a Xilinx Spartan-6 with a hardware PCIe x1 endpoint to provide the interface to the host CPU. On board DDR2 memory provides dedicated storage space for the FPGA application. They feature four RS-232/422/485 transceivers connected to FPGA pins allowing custom serial port implementations. A total of 96 I/O pins interface the FPGA to the outside world, and allow for a variety of signal levels.